Prefinished Exterior Trim | Legacy Pre-Finishing, Inc. The exterior trim package on a custom home is one of the most complicated decisions a builder or homeowner makes, yet often becomes an afterthought when planning for a home's curb appeal. On many homes, trim is responsible for distinguishing the home's exterior personality. People often choose a style and color of siding, then pick an economical trim option in a standard "deco-white" shade. If you substitute cheap trim, you may end up with complicated and costly repairs down the road. Every house has some exterior trim, whether it is: window trim, door casings, corner boards, moulding, soffit, frieze boards, fascia or other exterior detailing. If you use interior materials, and don't properly seal them, they will quickly fail and rot. Start with quality exterior rated trim materials, and prefinish them on all sides before installation. In addition to protecting the trim materials, prefinishing offers the opportunity to properly prime and apply as many topcoats as you wish with much less cost and complication than coating them on a jobsite. Call us to help you plan your homes trim materials! Legacy Pre-Finishing does not cut corners when it comes to quality primers. Although we can apply any primer you choose, we understand the value and quality difference that the more expensive primers may offer. Our house primers are high solids alkyd (oil) based, offering superior leveling, hiding, and sealing characteristics. Oil primers are typically preferred by carpenters due to the excellent bonding surface they create for topcoats, and significantly reduced grain raise. Oil primers sand easily, and don't gum up on sand-paper. Legacy's standard primers are gray, white and off white, but can also be tinted to almost any color you want in an UV resistant one-coat product which carries a 5 year warranty alone or can combine with additional factory or field topcoats for up to a 15 year warranty. Primers are applied to all sides, encapsulating the wood with six-sided back-primed protection. 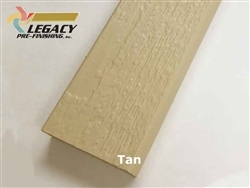 Legacy Pre-Finishing offers various "factory finished" multi-coat prefinish applications that offer fully finished siding or trim products ready to install. Cedar, cement, and other composite products can receive different combinations of oil and acrylic coatings to offer up to 25 year warranties. Siding receives primer and high-solids acrylic topcoats factory applied for maximum protection. During installation, only minor touchup is required to seal the ends of boards, and cover caulk and exposed nail heads. When carefully installed, touchup work is minimal and cost savings can be significant versus field applications. Some customers buy two-coat pre-finished siding and choose to add a third field applied coat for maximum protection, which also eliminates most touchup. Legacy Pre-Finishing, Inc. offers Seamless Staining of exterior siding and trim, as well as interior woodwork. Seamless means that each board is stained from one end to the other with uniform coverage, and consistency unmatched by field-painting. Legacy's brush roller system actually floods stain onto the substrate, saturating the surface, then brushes each piece continuously, removing excess stain and totally eliminating lap marks. You can not achieve this when field applying any transparent, semi-transparent, or semi-solid stains. Products will look consistent, and will weather evenly. In addition, more than 95% of the coating applied to siding and trim materials gets used - compared to approximately 50% for most hand spray applications. When you have difficult applications requiring no overspray, pre-stained is the only acceptable application. Legacy Pre-Finishing also applies acrylic semi-transparent stains to fiber-cement siding and trim products, offering up to 15 year warranties and giving durable cement siding a unique natural woodtone look. Available in Cedar Texture or Smooth. All products are prefinished to order. Reversible Fiber Cement Trim with a cedar texture on one side and smooth on the other. All products are made to order.